Description: NREL has been optimizing electrode inks for new catalysts for several years as part of our core competencies in MEA integration and manufacturing. We have the equipment, expertise and methodologies to make these inks and to study the effects of composition and rheology. We have also developed and implemented small-scale processing capabilities for fabricating catalyst coated membrane- and gas diffusion electrode- based MEAs. FCTO-funded capabilities include ultrasonic spraying, knife and rod coating. However, we can leverage other NREL-internal capabilities such as inkjet and aerosol spray, and slot die sheet coating. 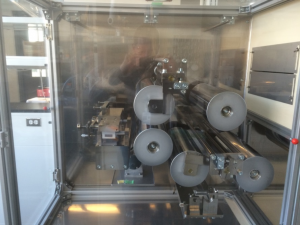 In addition, NREL recently has used internal funding to install a multi-technology roll-to-roll (R2R) coating station. This equipment has multiple coating technologies, i.e., slot die and microgravure coating; two independent drying sections. It can also run a variety of substrates at industrially relevant speeds, and has space for incorporating metrology and characterization. Thus NREL’s current capability enables single-sample-at-a-time production of small to many-meters-in-length electrodes of different composition, and comparison of the process parameters and resulting electrode structures based on several types of relevant deposition processes. 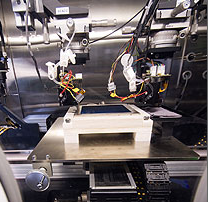 In addition, NREL has performed high-throughput materials discovery for inorganic, semiconductor-based materials for research in photovoltaics (PV) for 15 years, resulting in proven protocols and methodologies that can be leveraged for new capability development. Capability Bounds: NREL’s current capability enables single-sample-at-a-time production of small to many-meters-in-length electrodes of different composition, and comparison of the process parameters and resulting electrode structures based on several types of relevant deposition processes. These are all laboratory-scale capabilities with no pertinent bounding limitations. Unique Aspects: These capabilities reflect NREL’s core competency in MEA integration and manufacturing. The breadth and scale of the deposition capabilities as well as the principle investigator background in industrial R2R processing is unique. Availability: There are no pertinent use limitations. Some of the capabilities are in the NREL Energy Systems Integration Facility. Benefit: Development of electrode compositions and structures has traditionally followed a very linear pathway. This capability enhances the high-throughput and combinatorial aspects of ElectroCat in electrode development. This capability utilizes relevant substrates and methodologies to fabricate electrodes (i.e., scalable processes) in ways that enable high-throughput evaluation of matrices of electrode compositions and structures. In combination with high-throughput electrode performance evaluation, this enables accelerated evaluation of PGM-free electrode ink composition and properties as well as process parameters for optimal uniformity, performance and durability. 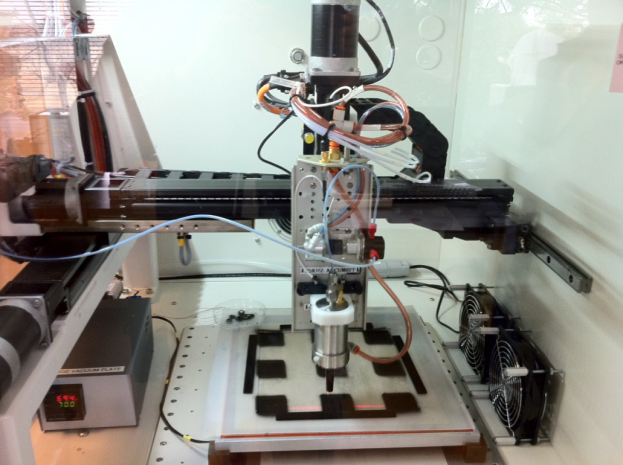 Above left, Ultrasonic spray system fabricating multiple electrodes. Above middle, aerosol jet spray system. Above right, multi-technology coating station with slot die and microgravure coating ability, two oven sections and an interleaf peeler.